Irresistible quality Abalone-paua shell necklace, in vibrant iridescent colors and with swirled intricate patterns, light up this design inspiration and creativity. An ideal gift for that special person. 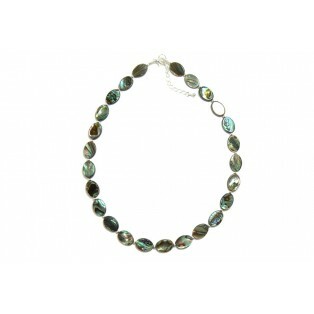 I have lovingly created this gorgeous silky and enchanting necklace using wonderfully smooth polished oval shaped beads and spaced them with tiny silver plated beads between. The necklace measures 16" (41cm) and I have added a silver plated extension chain so that it can be worn longer if necessary. The silver plated clasp and extension chain are "Nickel Free" to comply with EU regulations.